Updated on Wednesday, Nov. 26 3:20 p.m. EST with quotes from Joshua Wong and Lester Shum after the photos. Prominent student leaders Joshua Wong and Lester Shum have been arrested in police clearing of Mong Kok on Wednesday, Nov. 26 Hong Kong time. 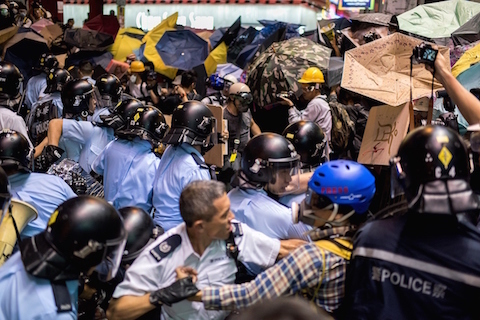 The arrests were made by Hong Kong Police Tactical Officers (PTU) at about 10:20 a.m. (9:20 a.m. EST) at the barricades between Argyle Street and Dundas Street on Nathan Road. PTU officers clad in blue jumpsuits entered the site and started making arrests after protesters refused to clear the area following numerous announcements by the bailiffs and police. Joshua Wong, convener of the student organization Scholarism, and Lester Shum, the deputy secretary general of the Hong Kong Federation of Students (HFKS) were at the forefront of the protesters and were promptly arrested under the charge of “contempt of court” and taken to Kwai Chung police station. In a Twitter post, Wong mentioned that Chinese University’s Student Union member Jason Szeto Tze-long and League of Social Democrats Raphael Wong Ho-ming have also been arrested. Wong and Shum were on scene to observe the clearing of Nathan Street in Mong Kok as per court injunctions. SCMP reports that Joshua Wong said the police were using the injunction as a smokescreen to cover up their removing of protesters before he was nabbed. Wong also accused bailiffs of failing to properly explain the court order. “Many people arrived in Mong Kok last night because they were unhappy about police overstepping their mark,” said Wong, adding that protesters needed to “hold the fort” in Causeway Bay and Mong Kok. Bailiffs and plainclothes police officers arrived to clear Nathan Road shortly before 9:00 a.m. to read out the high court injunction. Taxi drivers from the Taxi Alliance, the plaintiffs who applied for the injunction, were also present to help with the clearance. Donning red caps and “I Love HK” T-shirt, the volunteer cleaners heckled the protesters at the barricades while they went about their job. When asked by Joshua Wong, the bailiffs refused to answer questions on whether people were considered to be “obstacles” for removal. According to the South China Morning Post, Wong said police were using the court operation as a pretext for removing the protesters. He also accused the bailiffs of failing to properly explain the court order. “Many people arrived in Mong Kok last night because they were unhappy about police overstepping their mark,” said Wong, adding that protesters need to “hold the fort” in in Mong Kok and Causeway Bay. 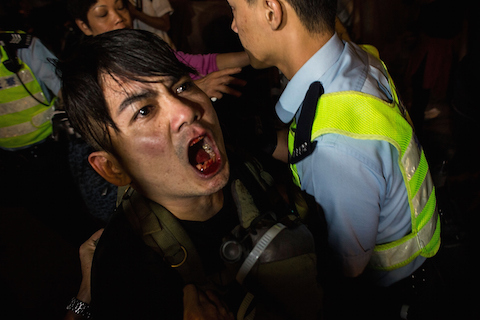 HONG KONG—Police clearance of Mong Kok today took a violent turn in the evening.